As budget cuts have limited some grand schemes for detecting Earth-like planets around distant stars, an new scheme to do it on the cheap has been proposed to NASA. 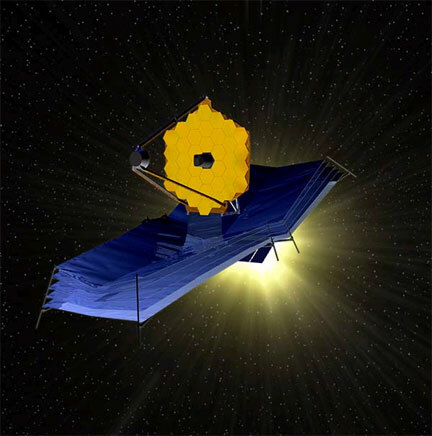 Called the New World Observer, the plan is to place a flower-shaped disk in front of the James Webb Space Telescope (the proposed successor to the Hubble Space Telescope). The 40 meter (131 foot) disk will be placed 30,000 kilometers (18,641 miles) in front of the telescope, to shield the telescope from the bright starlight, allowing the faint planets around it to be seen. The project is the brain-child of Webster Cash, director of the Center for Astrophysics and Space Astronomy in Colorado. The strange shape of the disk, with flower-like petals on the edges, prevents diffracted light from reaching the telescope. The petals cause the diffracted light from the edges of the disk to destructively interfere with one another. The star shade should allow the telescope to see planets around stars as far away as 35 light years from Earth. The disk does not need to be made with extreme precision — a few millimeters here or there will not make much difference from 20 miles away. And the disk can be a few meters out of alignment and still block the light from the star. The cost of the project is thus small enough to qualify for one of NASA’s least expensive missions, the “Discovery-class”, which has a cost ceiling of $425 million. But Webster Cash is not stopping there. His New World Imager proposal calls for two telescopes and two star shades, orbiting a thousand miles apart, forming an interferometer. With such a telescope, he expects to be able to image features on the remote planets, such as oceans and continents, and search for “biomarkers” such as oxygen and ozone, that would indicate life exists on the planet.